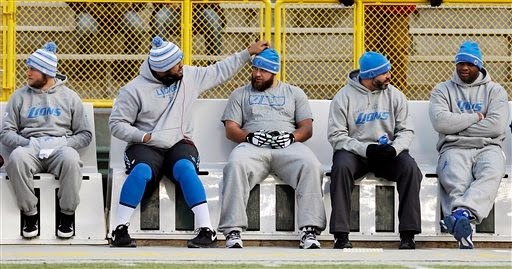 No surprises among the Detroit Lions inactives for the huge game at Green Bay. Curiously enough though, the Packers are keeping all three quarterbacks active. That could be a sign that they have some concern with Aaron Rodgers’ calf which limited him in practice all week. Rookie Travis Swanson will start for Dominic Raiola which is no surprise. Darren Keyton, who was signed from the practice squad on Saturday, is active and will be the backup center. Other inactives for the Lions: Nick Fairley, Ryan Broyles, Larry Webster, Rodney Austin, Caraun Reid, Josh Thomas and Kellen Moore. Inactives for the Packers: RB DuJuan Harris, CB Davon House. LB Carl Bradford, C Garth Gerhart, TE Justin Perillo, WR Jeff Janis and DT Bruce Gaston. Kickoff is 4:25 on FOX with Joe Buck, Troy Aikman and Erin Andrews. Five keys for the Lions.